Purpose-built after the Second World War, Courchevel ski resort is made up of four unique villages offering something for every taste and budget. Sitting at the top, both figuratively and literally, Courchevel 1850 boasts Michelin starred restaurants, spectacular chalets and a price tag to match. Courchevel Moriond (formerly know as 1650) has a unique character and style and is home to quieter ski slopes. Courchevel Village (1550) is less commercial and offers more economic accomodation in a pretty setting, while Courchevel Le Praz (1300) retains a rustic French village feel that is perfect for families. 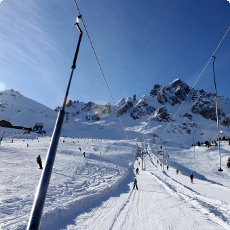 All of the Courchevel villages give great access to the surrounding ski slopes, which provide a great range of pistes for all ability levels. 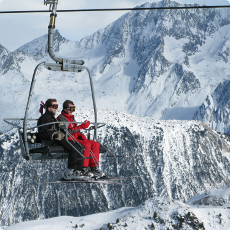 An impressive network of lifts leaving Courchevel also gives access to the huge Trois Vallees ski fields, and the varied terrain contained within this area. With a wide range of bars and restaurants catering to every taste and budget, Courchevel provides a huge range of apres-ski activities. Away from food and drink, the Aquamotion centre in Moriond has swimming pools, water slides and spa facilities. Courchevel also hosts several unique events throughout the winter including the Ladies World Cup Slalom, International Fireworks Festival, and Les 3 Vallees Enduro. Snowbus provide both shared and private transfers from Geneva airport to all the villages of Courchevel. Private transfers are a door-to-door service for up to 19 people in one of our comfortable minibuses. Shared transfers from Geneva airport to Courchevel allow the booking of individual seats on a scheduled bus. With regular departures on Saturdays and Sundays, and convenient stops in all villages, shared transfers are the cheapest transfer method of travel for smaller groups journeying between Geneva and Courchevel. Snowbus run private transfers for large groups of up to 19 people (and more on request) from Grenoble airport to Courchevel. This represents the quickest way of getting between the airport and ski resort on holiday. We also operate a shared transfer service from Grenoble airport on Saturdays. Ten buses running at regular intervals on Saturdays make getting to any of the Courchevel ski resorts easy and at a low-cost. Chambery airport is the closest airport to Courchevel resort at 110km, and Snowbus exclusively provide private taxi transfers from here. With a quick minibus transfer for any size group we can provide a cost-effective method of getting to anywhere in Courchevel for groups of skiers and snowboarders. With major airlines operating in and out of Lyon, this airport represents a great way of getting to and from Courchevel ski resort. Snowbus operate private taxi transfers seven days a week between Lyon airport and Courchevel ski resort during the winter season for a quick, comfortable and low-cost journey for any size group.